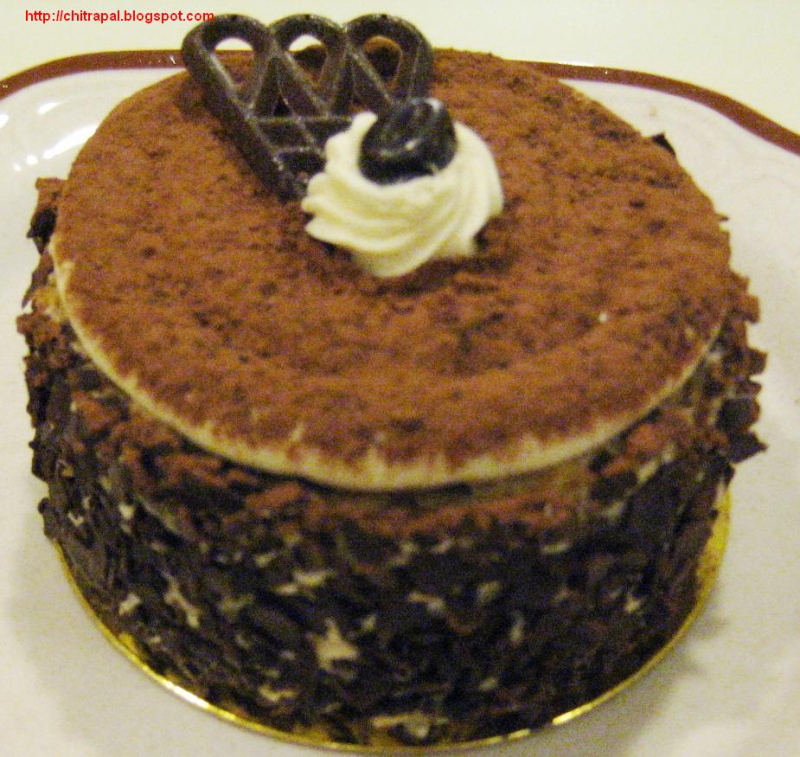 It is one of the most popular Italian cakes. It is made of Savoiardi (otherwise known as lady finger biscuits) dipped in espresso or strong coffee and layered with a whipped mixture of egg yolks, mascarpone, and sugar, and topped with cocoa. One chocolate covered biscuit/cookie (any different shape like a regular cookie). Take cake molds (for individual) and the plastic wrap inside to outside; so that when Tiramisu can be take out from the cake pan after it easily. Place golden cake bottom to give support to cake. Grease inside of the pan with very little butter. Cover it with some shaved semi sweet chocolate and cover it with lid shake well so that chocolate sticks inside of the pan. Keep it in freezer for at least 1 hour so that chocolate sticks to the pan. In a large bowl beat egg yolks and sugar until thick and pale, about 5 minutes with electric mixer with whisk attachment. Now add mascarpone cheese and beat until smooth paste. Add 1 tablespoon of espresso and mix until combined. In a small shallow dish, add remaining espresso and rum mix well. Place the soaked ladyfinger on the bottom of each cake pan. Fit them in bottom very well. Spread evenly 1/2 of the mascarpone mixture over the ladyfingers. Cover tiramisu with plastic wrap and refrigerate for at least 5-8 hours. Now before serving take them out of the fridge with the help of golden cake support below and place it carefully in the some plate. Sprinkle coco powder on the top with the help of strainer. Garnish with whipped cream, cookie on top and M&M on the top. Now slide it carefully on the serving tray. This dessert is sooooooooooo yummmmmmmmmy.Thanks.